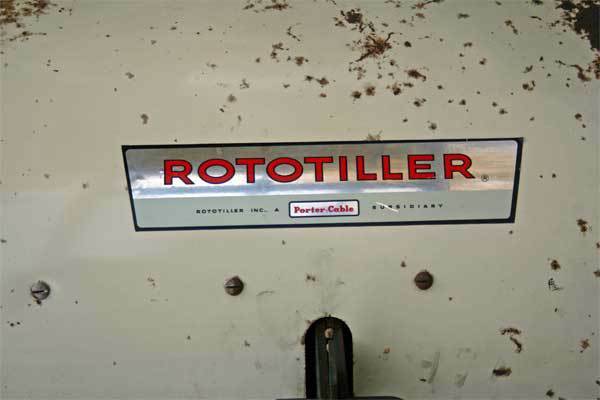 This is a new old stock Rototiller 133 built when Rototiller was owned by Porter Cable. The s/n is 153, which means it was made very early in the short lived Porter Cable era, which began in 1959. 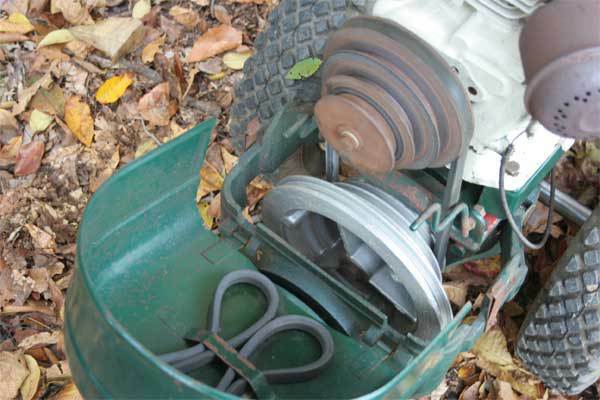 In fact under the green paint on some parts is red paint, which is the color used on Rototiller, Inc. tillers since the introduction of the Model T in 1949. Basically it is a repainted Model 2. 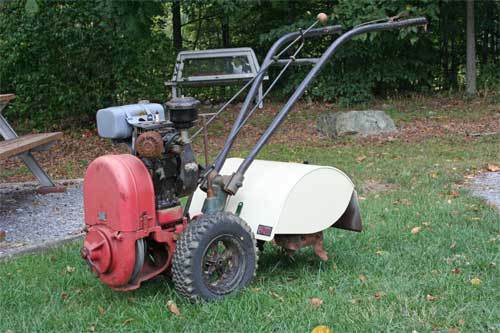 It appears that 1958 was the year Rototiller changed the design of the handlebars from the relatively straight bars with wood extensions to the configuration used on this 133 and later on the Troy-Bilt Horse. 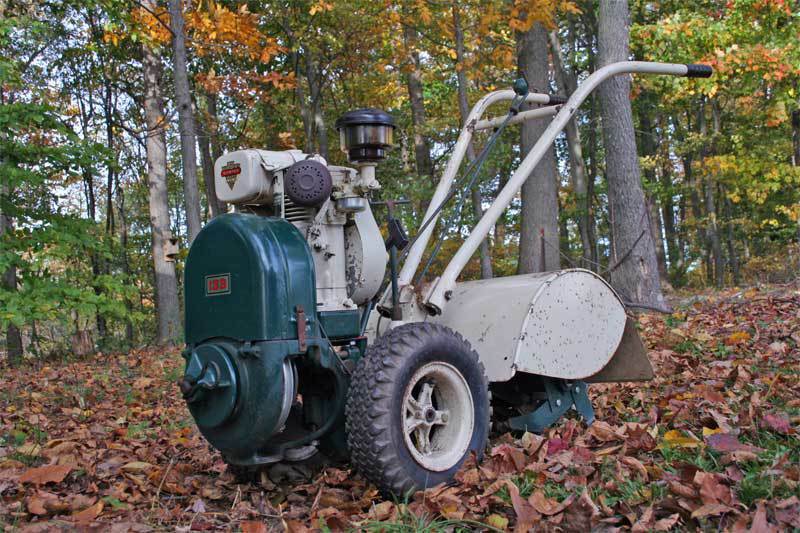 This 133 is powered by a model B1290 Clinton 4 hp all cast iron engine. To the left is the decal on top of the tiller hood. 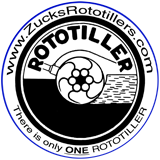 Click on the decal for a larger version. 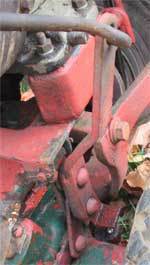 The 133 has the same 4 step sheave setup that all the red Rototillers used from 1949 through 1958. The extra belt is for the low speed sheave since it is much larger in relation to the other steps on the bottom multi-step sheave. 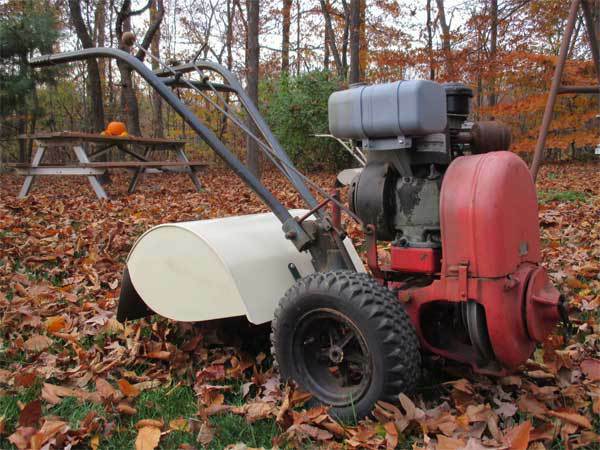 In 1957 Rototiller switched to a steel motor sheave. Now more about the new old stock story. I found this tiller in the basement of a house at an old closed Rototiller dealership. It had never been sold or used. I believe it was built in 1959 so it is 56 years old. After getting it home I found some damage that probably prevented the dealer from selling it. On the bottom of the wheel transmission there is a drilled and tapped hole for a bolt that holds the front lower casting in place. That hole is partially broken out like the tiller had an impact in that area. I tapped the hole as deep as I could and inserted a piece of threaded stock with a nut for a quick fix. I will not be working it hard with attachments so I am confident it will be fine. The left tine holder and the front round plate that retains some of the attachments were missing. However, there in the basement was a tine holder with tines slightly worn that I got, repainted and installed. I had an extra front plate that I repainted green. After checking the fluids it was off to till its first ground. Check out the YouTube video HERE. This was my first Porter Cable Rototiller. Click on the photo for a different view. It is a 133a built later with a s/n of 7108. The original engine on this one was replaced with a model 498 0301 Clinton engine. Most likely the original engine was a model B1290. It is identical to the 133 above with one exception, for whatever reason the clutch shift lever arm was changed (see photos below). This tiller was originally painted the same colors as the 133 above. Another change I noted on these 133 tillers is the main tube which houses the drive shaft is 3" longer than my other Rototiller Models T, 2, & 3. I think this change was made in 1958 when the handlebar change was made.